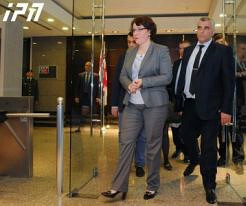 TBILISI, DFWatch–Three new ministers Monday started working, even though they haven’t been approved by parliament yet. Constitutional experts say it is unlikely that they have a right to function as ministers. The three new appointees arrived at their respective ministries Monday, where their predecessors hosted them and held a formal transfer of duties. In a break with previous appointments in Georgia, the prime minister did not introduce any of them before they started working. In case a minister is replaced, the first time the new minister comes to the ministry he or she should be accompanied by the PM, who will introduce the new minister to the staff. On Monday, the PM didn’t attend any of the three ministry handovers. Three new ministers were named last week: environment, sport and defense. The candidate for environment protection minister is MP Gigla Agulashvili, sports and youth affairs minister candidate is former deputy Tariel Khechikashvili, while defense minister candidate is MP Tina Khidasheli, who is the wife of the speaker of parliament. Khidasheli was an unexpected nominee for defense minister, because earlier, the PM claimed that only ministers who recently resigned, would be replaced: the environment and sports ministers. A week before that, the minister of infrastructure resigned and his replacement was soon found. If a third of the government is replaced, parliament has to declare confidence in the new government. Since there are 19 members in the cabinet, plus the PM, the seventh ministerial replacement is the tipping point for when a government must be dissolved. At this point, a new government is formed and approved by the parliament. Friday morning, the acting prime minister named candidates for the new government and among the replaced ministers were the new defense minister. Garibashvili did not explain the reason for replacing Mindia Janelidze, who served on this post only a few months and was often criticized. The PM named the candidates and asked parliament and president to accelerate the process to approve the new government. The president, however, did not accommodate, but chose to postpone the process for a week, explaining that everything was unexpected, as he learned about the replacement of the defense minister very late. He didn’t sign the list of candidates and took a week to ‘think more’. The prime minister then responded that the government doesn’t need a confidence vote in parliament to function and the ministers have already been appointed, but constitutional experts do not agree with him, underlining that parliament first has to approve the government. The opposition also agrees with this, but the ruling coalition in parliament claims the government is able to function before parliament approves it and they don’t need a vote of confidence for that.